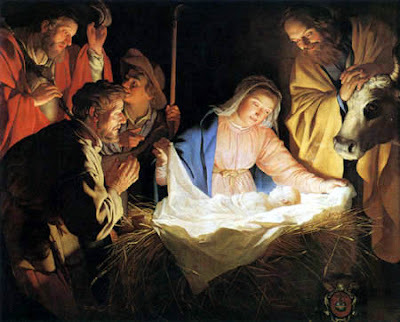 I wish everyone a very happy and blessed Christmas! I'll wish you a merry Octave too, for I'm not sure when I'll next be posting. Most of Christmas Day will be spent in church and presbytery dining room (where nine of us will be sitting down to turkey et al, including five priests). Then on St Stephen's Day I'm going home for my second Christmas meal. I'm staying there a few days and may post something, though my father's ancient dial-up connection is painfully slow. Update: We have a rather bare, modern (1964) church, so we did our best in decorating it for the great feast. At least there is a central tabernacle and plenty of space on the sanctuary, both behind and front of the altar. Blessed Christmas Fr..looking forward to your future posts.. I didn't think an orthodox priest would offer for our admiration "and lives today in Bread and Wine". The inroads that Lutheran doctrine has made in the Catholic Church are truly depressing. A built-in sensitivity to the teaching of Trent would immediately make Betjeman's line seem repugnant. The real presence of Christ means the real absence of bread and wine. Aquinatic - thank you for your kind comment and a very happy Christmas to you. I wasn't treating Betjemin's poem as a theological treatise. Christ is truly present in the Blessed Eucharist, body, blood, soul and divinity. The accidents of bread and wine remain, though they are now of Christ's Body and Blood. I think an orthodox Catholic can still appreciate Betjemin's poem (and it is only that) if you read the last line from this perspective. Merry Christmas from the States! BTW, ever considered a damask wall hanging behind the altar? Perhaps some riddle posts too? Do people in Britain use the term "Merry Christmas" or only "Happy Christmas"? I am curious as to the difference between us on that trivial point. Anyway, and very merry, happy, and blessed Christmas to all. Depressing indeed that our Catholic Church no longer sees fit to teach Catholic doctrine. However, I think Fr Nick's riposte was fair play: there is a difference between doctrine and poetry. You should try attending Mass in Guildford where, this evening, for our edification, the choir sang a hymn with an almost identical line! My wife, bless her, nearly wept.